The Hoosac Tunnel is a place of history, mystery, and death. Located in North Adams, Massachusetts, and travelling 4.5 miles away to Florida, Massachusetts, the railway connected the little valley to much of the other parts of the state. Finally opened in 1875, after over 20 years of construction and nearly 200 deaths, the Hoosac Tunnel is the master of length, technology, and a survivor of time. 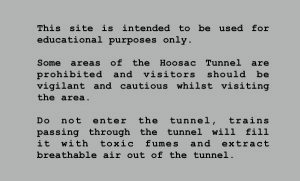 Each page on this site contains different information about the Hoosac Tunnel in all its various stages of existence. Our mission is to create an online space where North Adams locals can learn more about the Hoosac Tunnel and the surrounding landscape through the past, the present, and the future. We aim to bring this knowledge to the public in an immersive site that documents nature reclaiming itself while living alongside man-made structures to limit future invasion of nature’s space as it is reclaimed. Also check out our blog where we update our process and give a behind the scenes look of our site, videos, and more!